Taking a photograph that tells a story requires patience, knowing what you want to say and then picking the right moment. 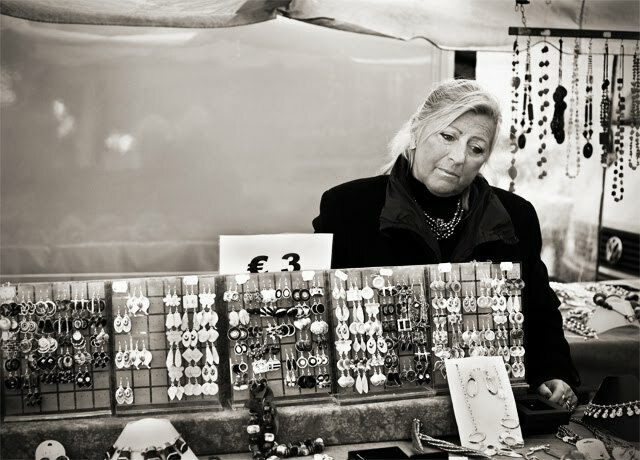 I noticed this lady selling jewelry on the market. She was chatting to customers and showing them her merchandise but nobody bought anything. She was aware of me taking pictures and didn't mind. I kept an eye on her and picked the moment that I thought told the story of her day on the market. There are still many businesses struggling with the recession and people have certainly tightened up their budgets, even on items like market jewelry. I decided to upload this image to illustrate how waiting patiently and picking the right moment can produce an image that communicates the story. A few seconds later her expression changed and the brave sales face was back on again. Sometimes photographers take a lot of images in the hope of getting one good one. Seems too hit and miss to me. The real key to getting that good image is figuring out what needs to happen in front of your lens to tell the story. Then with patience and timing you can photograph the moment, a split second that nails it.